A Congress so important, it was held at London’s Royal Empire Society Hall. Having already provided the initial results of his research, with solutions in place to address the immediate effects of radiation, L. Ron Hubbard’s research continued at an even more urgent pace. Point of fact—in the three months that intervened between Congresses he delivered no less than 83 lectures, personally instructing two Advanced Clinical Courses for auditors. And what that research revealed was not only the rock-bottom eternal answer to radiation, but a technical milestone which stands to this day as the means to reach every case: Control, Communication and Havingness (CCH). It’s a trio he described as ranking in importance with Affinity, Reality and Communication (ARC) and, in application, capable of resolving the problems of Man with a simplicity that cannot be exaggerated. At the heart of this Congress is Mr. Hubbard’s definitive trilogy of lectures on radiation—lectures so groundbreaking that copies were immediately requested by Members of Parliament and which form the basis of the book, All About Radiation. 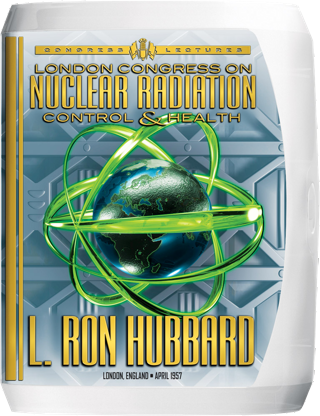 Just four months earlier, L. Ron Hubbard had already delivered a first Anti-Radiation Congress in Washington, DC, providing immediate solutions for its effect on individuals. But that by no means ended his search for answers to fully global concerns. The year was 1957. The United States and Communist propagandists in the Soviet Union boasted nuclear arsenals of sufficient megatonnage to obliterate every living thing across the Northern Hemisphere (give or take a few hardy species of insects and shrubs). And the operative word was propaganda. That was not to say that a nuclear bomb, dropped on a city, would not be devastating. But what had become increasingly clear was that an unlimited weapon against which no defense could be mounted posed another type of danger entirely. The mere scare of its use and the mystery of its effects could not only cause sickness by restimulating individuals, but even produce mass hysteria. And therein lay the real problem…a problem of magnitude. It was also the substance of his radiation research from January to March, now moving forward at an even more urgent pace, including his personal hands-on supervision of two Advanced Clinical Courses, comprising no less than 83 lectures of instruction for auditors. And the results of that research are what he brought to bear when this Congress convened on 12 April 1957. Once again, the location was entirely appropriate—London’s Royal Empire Society Hall. And neither Scientology nor the world at large would ever be the same. In fact, its application was so groundbreaking that in his next statement, Mr. Hubbard even redefined what a Scientologist is. As for what CCHs meant to Scientology’s future—they not only stand as the bottom-line technology to reach every case and make possible one’s full ascent up the Bridge, but to teach their delivery would in turn require the development of an entirely new type of auditor training drill, applied today in virtually all auditing. 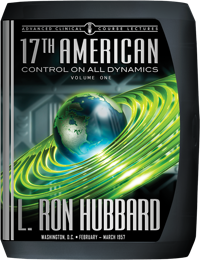 Then, too, there was all those factors of Control, Communication and Havingness meant to planetary salvage, all laid out in L. Ron Hubbard’s definitive trilogy of radiation lectures—a series within a series—comprising a summary of his breakthroughs deemed so vital that Members of Parliament requested immediate transcriptions, while the resulting document formed the core of the book, All About Radiation. Yet for the final summary of what this Congress contains in terms of full planetary salvation, it’s no less than a technology to end Man’s inhumanity to Man and bring a better civilization to Earth.